4. Reliance on Yourself vs. Reliance on God – It is for us easy to rely on ourselves when life is going great. We can own our success and strive to be more awesome than the person next to us. When times get tough we tend to blame God and point our finger at those around us. Within ministry, it is easy to put one’s successes and failures in the spotlight. We tend to highlight celebration stories and call out failures and mistakes. Through all of this, we become inclined to focus on the abilities of the individual instead of God’s love and abilities through the individual! Our students need to know they cannot rely on themselves. Every time I trust myself, I fail others. As I fail others I miss the purpose God has for me. When we trust God, we will impact others, and ultimately bring honor and glory to the Father! By relying on God, we will see life in a whole new way! God is love and we tend to be full of revenge. God is patient but we want things done immediately. God is faithful even as we fail Him! Our students struggle with balance, structure, and consistency. Relying on themselves is going to lead to an unbalanced, unhealthy, inconsistent walk with Christ. As we teach our students to completely rely on the Father, they will experience life to its fullness! 5. Large Group vs. The Whole Person – Is your level of success measured by how many come to your weekly student ministry gathering or how many individuals are drastically changed for the cause of Christ? Before I continue, please understand that when we see disciples made, numerical growth will take place. But, often we see numerical growth happen without authentic discipleship occurring. We must not measure success based on the number within the large group! For many youth pastors, much your time is spent impacting the largest amount possible at one time. In other words, we pour into our weekly gatherings to make them fun, inviting, attractive, and full of energy. Although there is nothing wrong with that at a surface level, are we missing the whole person? In other words, are we missing the individuals God has called us to directly impact? 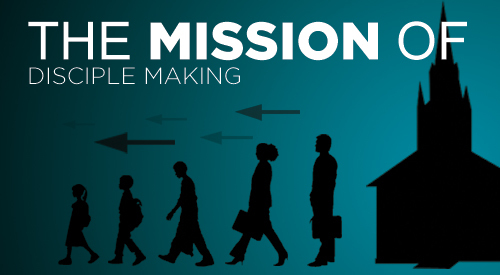 As we look at Jesus’ ministry, we see a model of ministry focused more on the 3 and 12 then on the 70, 120, and 5000. He poured into Peter, James, and John – opening his life to each of them in a very personal way. He looked at every aspect of Peter and desired to see him become whole! Peter took that example and carried into his ministry throughout Acts. Yes, there was time poured into large gatherings, but Jesus had a heart for the individual person. As you look at your schedule, how do you break up your time? Are you spending a good portion of your time ministering to those closest to you or is all of your time eaten up by the attractional aspect of programs and events? Who are your 3 and 12? What does that relationship look like? Are you living a life worth imitating in order to create a culture of discipleship? 6. Living for the Moment vs. Living on Mission – Culture has brainwashed our students into believing the living in the moment is more important than the overall mission. In others words, the decisions you make today won’t impact your tomorrow. Have fun and enjoy every moment to its fullest. Lie! I made choices in high school that have impacted my relationships as an adult – both with positive and negative implications. Many of those were ‘in the moment’ decisions that were exciting, adventurous, and fun. I did not realize how they would impact the mission God had for me. When we live moment-to-moment we tend to struggle with boredom. I have seen so many students bounce from one ‘great’ relationship to another because they become bored with what is happening right now. This can easily transfer into ministry. I have seen so many youth leaders live in the excitement of one event or one service. When the normal routine of ministry kicks in, boredom hits. I truly believe this is why so many youth pastors bounce from one place to another or from one level of leadership to the next. As we live on mission, the excitement of God’s calling will always get us through the difficult moments. There will always be circumstances that don’t make sense. As they times arise, are we living in the moment or living on mission for God? Is there an eternal focus and purpose driving every aspect of our ministries or are we just bouncing from one fun event to the next? As we live on mission we will experience the awesome impact a culture of discipleship can have on every moment within our ministries! My prayer is that our time, energy, resources, and passion are poured into a culture of discipleship! Attraction is important, but seeing lives focused on a love for Christ is most important. We must be rooted in Christ, focused on relationships and community, hearing God’s voice, relying on God, compassionate for the individual person, and living on mission for God! I would love to hear how this is played out within your ministry. Where do you struggle the most? Where do you see the most success?